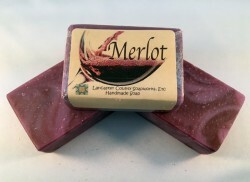 This gorgeous soap really fired our imagination. It is a heady, grapey blend which was heartily approved by the wine lovers who smelled it. We colored it like the swirls of a dark Merlot as it pours into the glass. Very special.